Pictured below is a special low voltage disconnect (LVD) device which we have been supplying for a few years for use by academic researchers in glaciology. 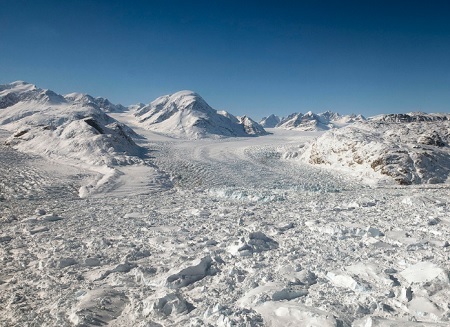 Solar charged batteries are being used to power GPS dataloggers on glaciers in Greenland. These GPS devices accurately record the movement of glaciers, and this (velocity) data can be used in a wide range of polar and climate change research. The specific set up for which these LVD devices were designed has a 48 Watt PV solar panel charging a 60-100Ah 12V battery via a Sunguard solar charge controller. In high polar regions, in the summer, the sun is in the sky 24 hours day, but in the winter is is below the horizon 24 hours per day. Therefore, during the winter months the battery cannot be charged. For the battery to still be usable in the spring it must retain some charge, so the GPS has to be disconnected before it overly discharges the battery. 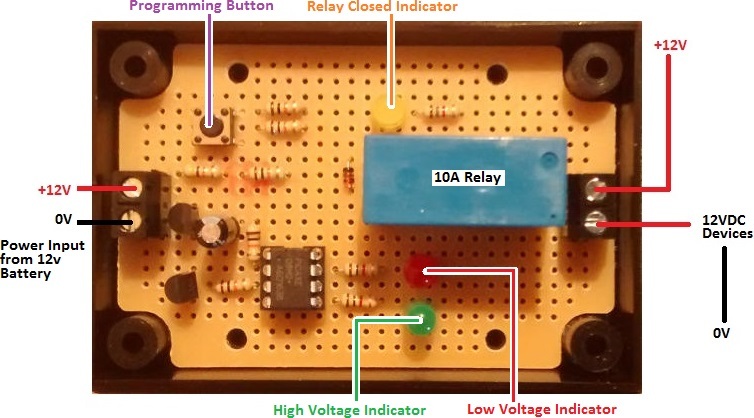 The GPS modules have their own built in low voltage disconnect circuitry, but a step-up voltage regulator is fitted between the 12V battery and the GPS modules (which need 15+V to operate), so the GPS sees a steady consistent good voltage right up until the 12V battery is virtually dead. In our standard low voltage disconnects, the output is turned off when the battery voltage falls and remains below a user set low voltage for 10 seconds. The output turns back on when the battery voltage reaches and remains above a user set cancellation voltage for 10 seconds. For a solar powered system and often very limited daylight hours, this can see the output being turned on and off multiple times per day. This is not a problem for an LVD used with lighting for example, but the GPS modules used for this project create a new datalog file each time the power to the module is connected, and there is a 512 file limit. If over the course of the many months that the GPS module remains on the glacier unattended, the power to it is cut and restored more than 512 times, data will be lost which is not acceptable. In order to prevent this problem, our low voltage disconnect engages as usual after 10 seconds of low voltage being measured ensuring that power to the GPS is rapidly cut if the voltage is low, but then the voltage has to remain consistently over the cancellation voltage for one hour before the power to the GPS module is restored. Doing this ensures that the GPS is only powered up when the battery is known to hold enough charge to make it worthwhile taking up one of the 512 available file spaces. If you need any kind of special low voltage disconnect or voltage monitoring device, email neil@reuk.co.uk with details of your requirements.